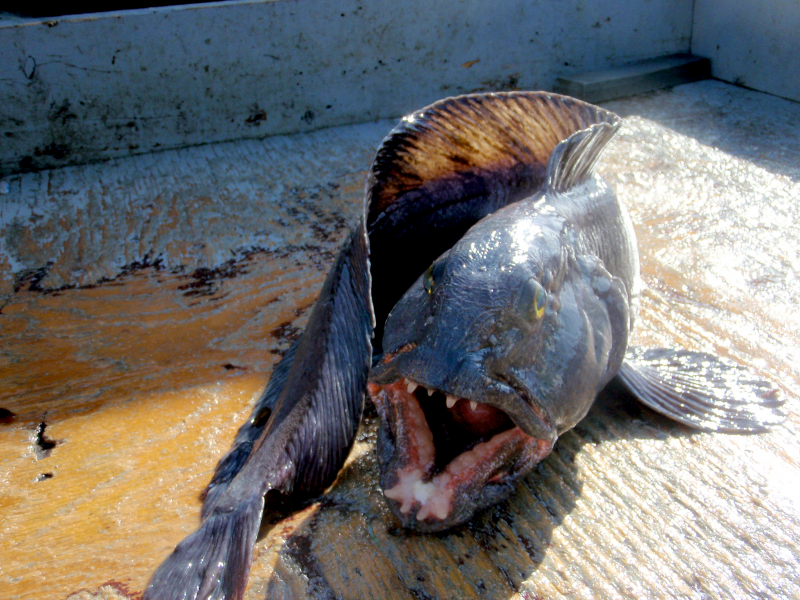 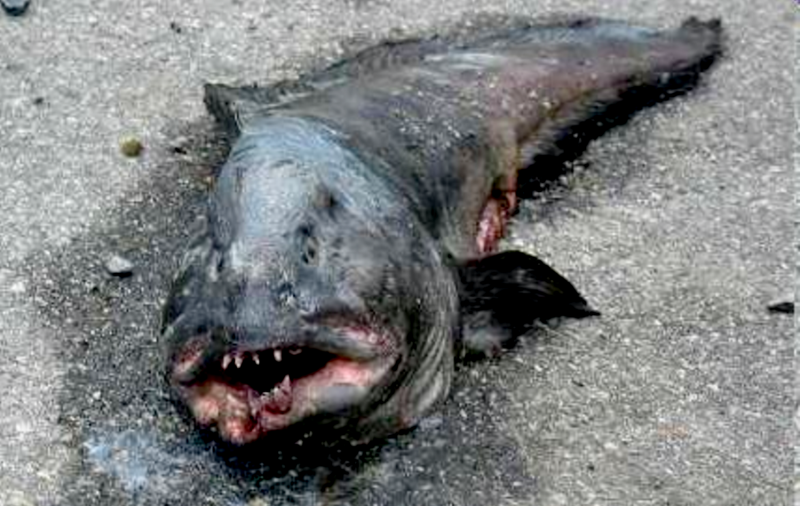 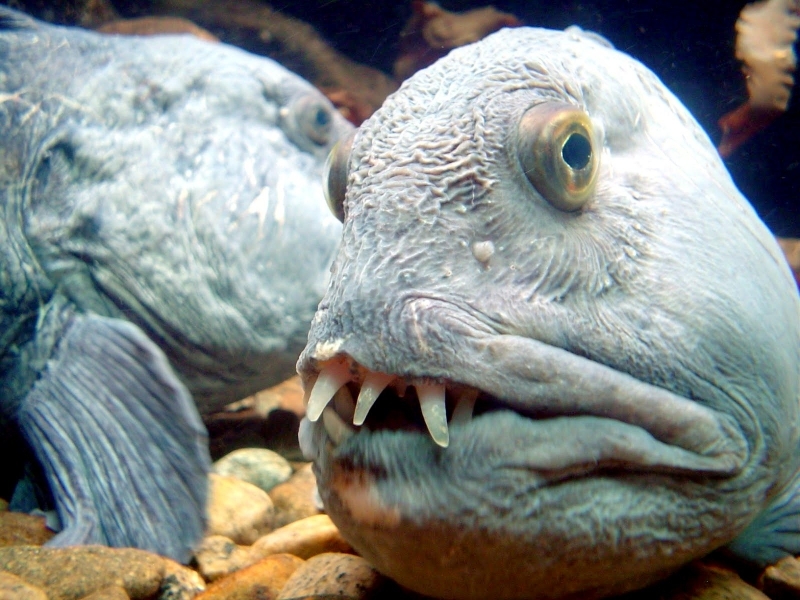 The Wolffish is a marine fish which is commonly found on the eastern & western coasts of the Atlantic Ocean. 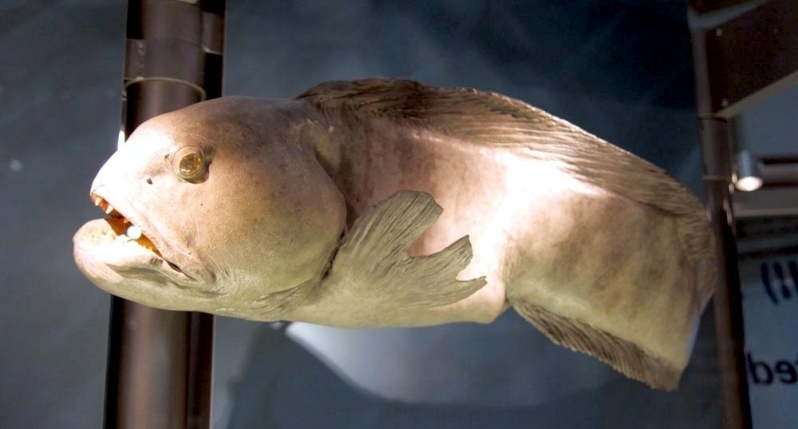 They have long, eel-like tails, but they get their name from their large head, mouth full of sharp and wayward canine-looking teeth. 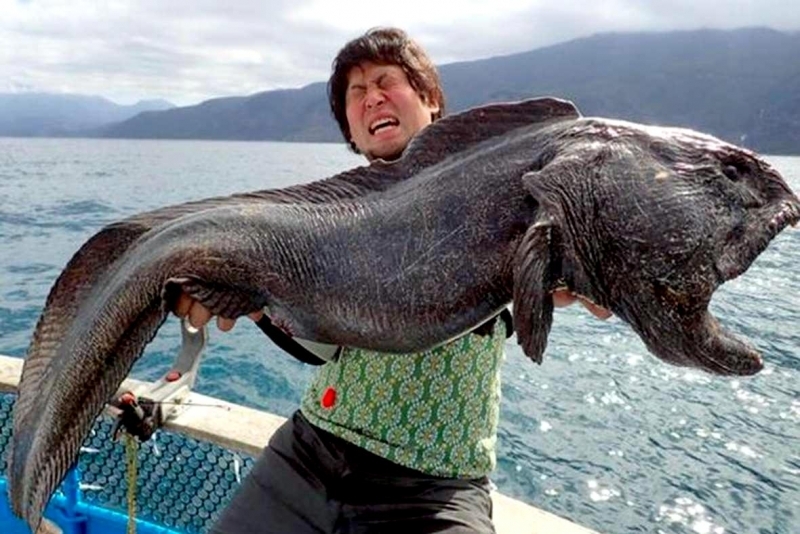 These large sea creatures are becoming a concern as their numbers are progressively decreasing due to over-fishing. 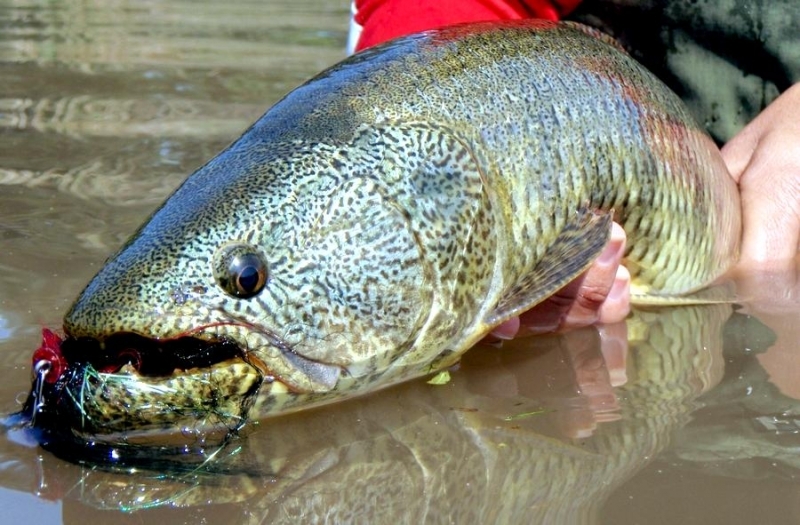 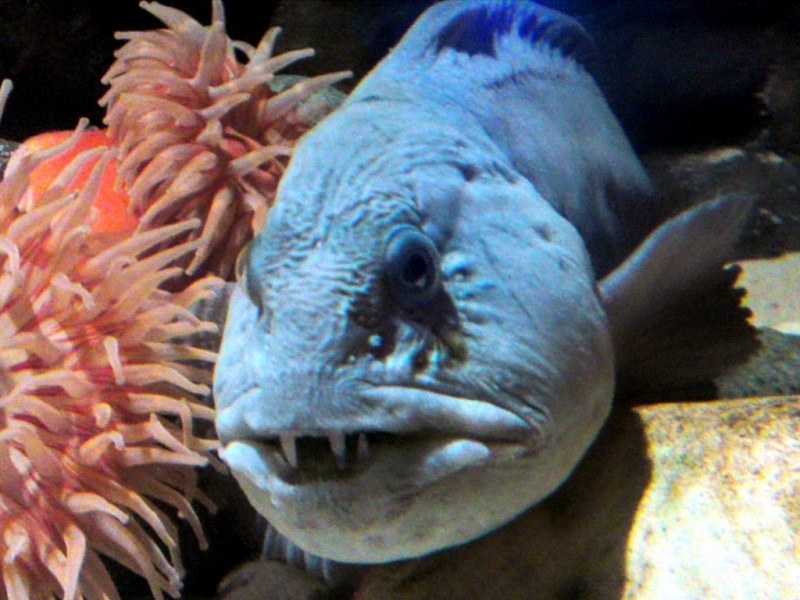 This fish has a vast array of interesting facts related to its appearance and way of life. 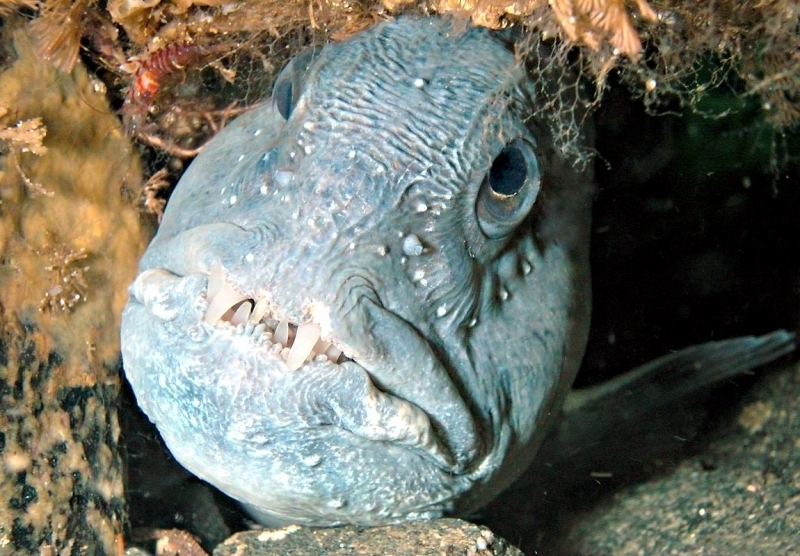 Wolffish are fearsome looking creatures, but their temperament is anything but fierce. 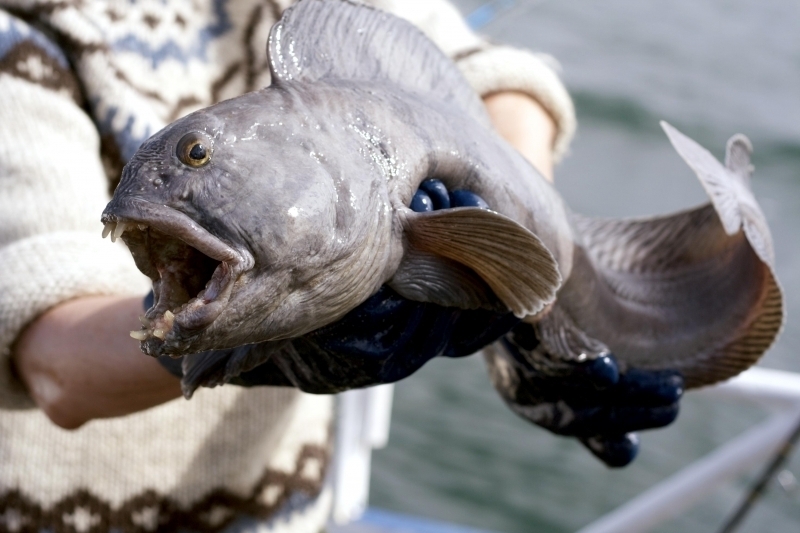 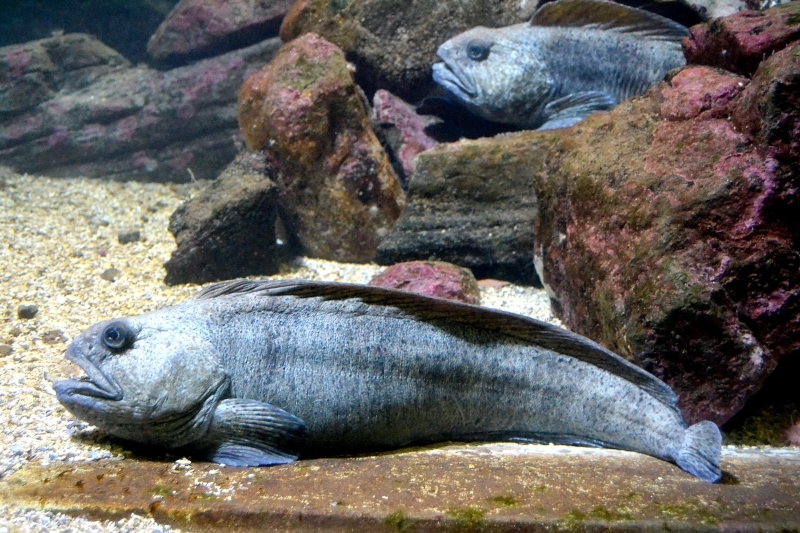 The Wolffish can grow to be roughly 5 feet in length & weigh up to 40 pounds. 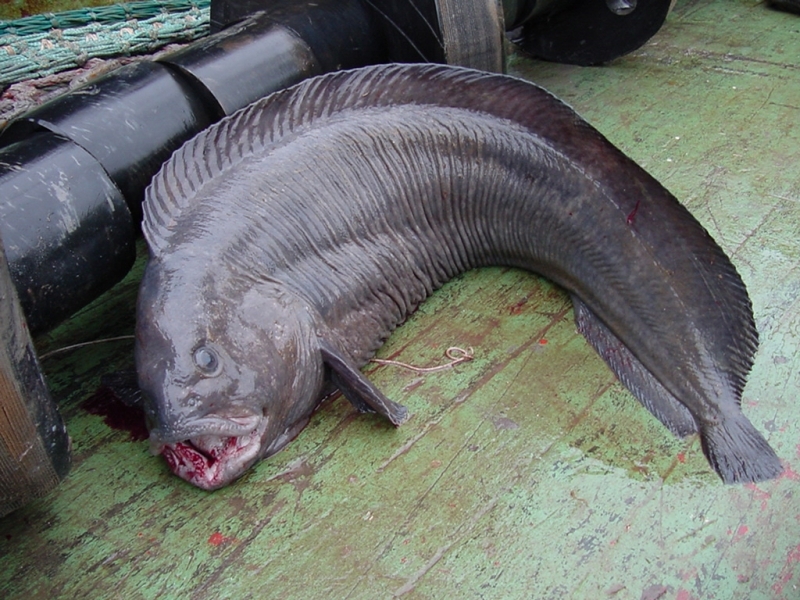 Its body is long, smooth & slippery with scales embedded it the skin. 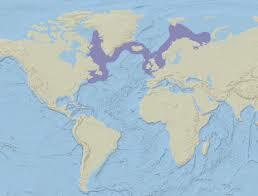 They can vary in color from a purplish brown color to green, to blueish grey. 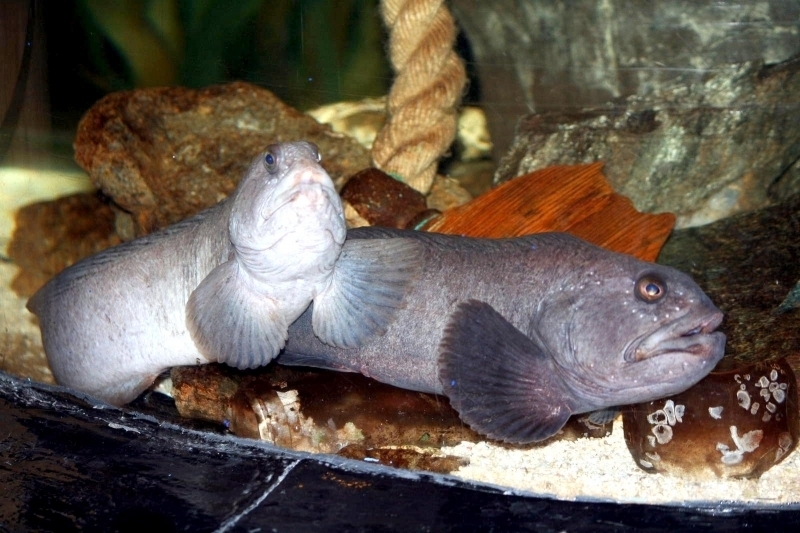 Its dorsal fin stretches all the way down its back and its pectoral are large & round in shape. 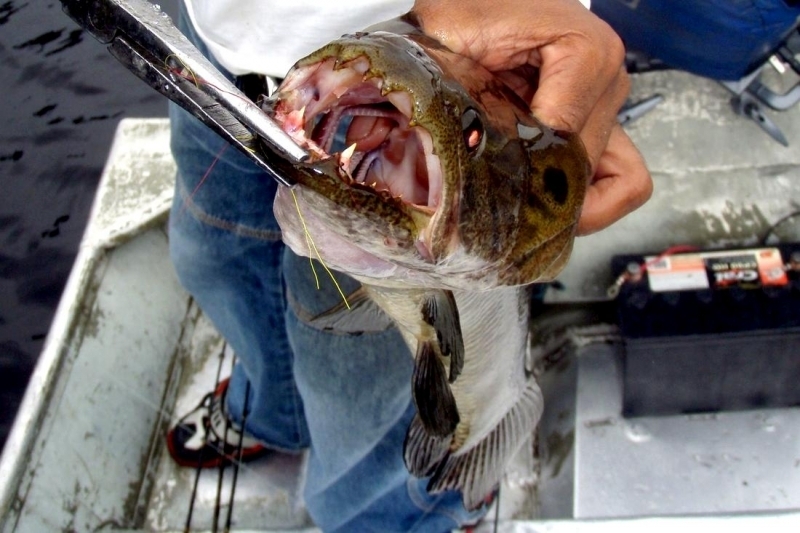 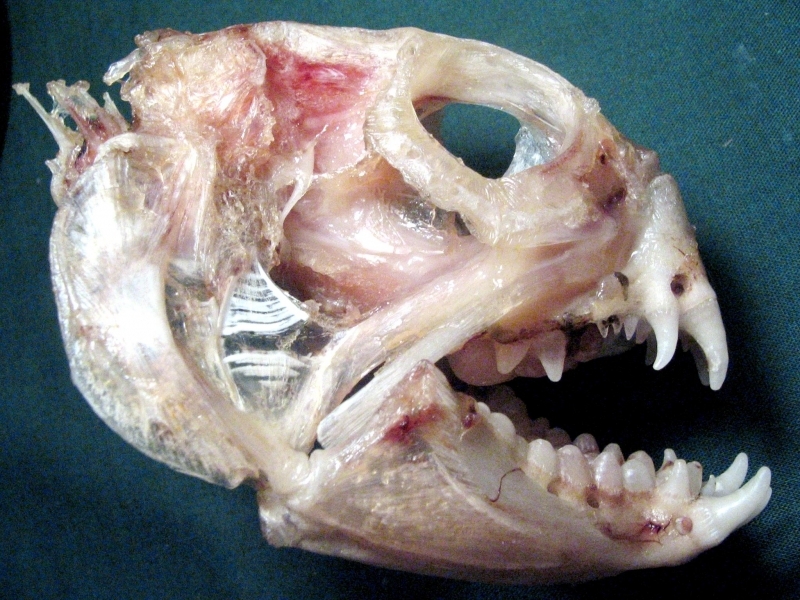 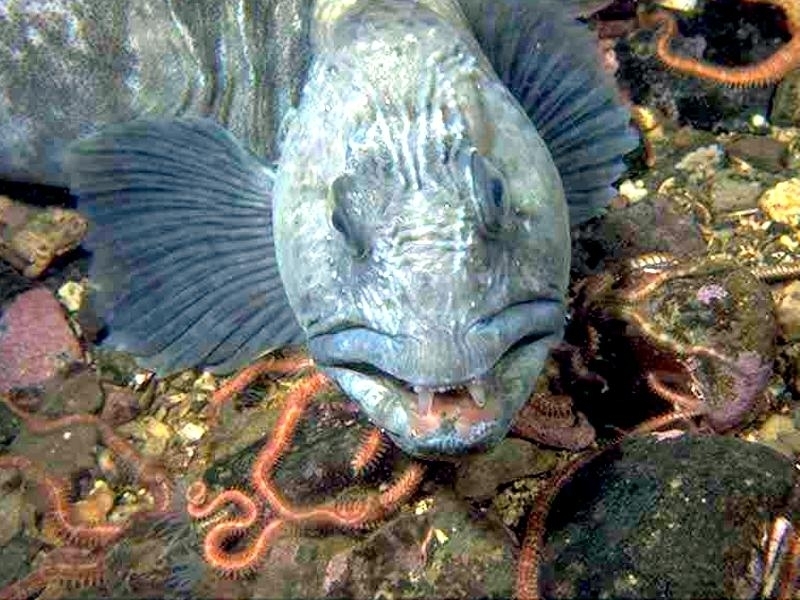 The physical feature of the Wolffish that stands out most is its teeth. 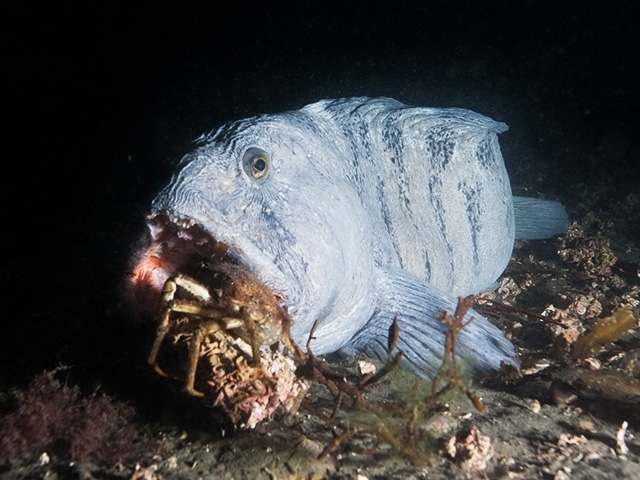 Their upper & lower jaw are armed with 4 to 6 fangs with 3 rows of strong, crushing teeth behind these fangs on the upper jaw and 2 rows behind the lower jaw. 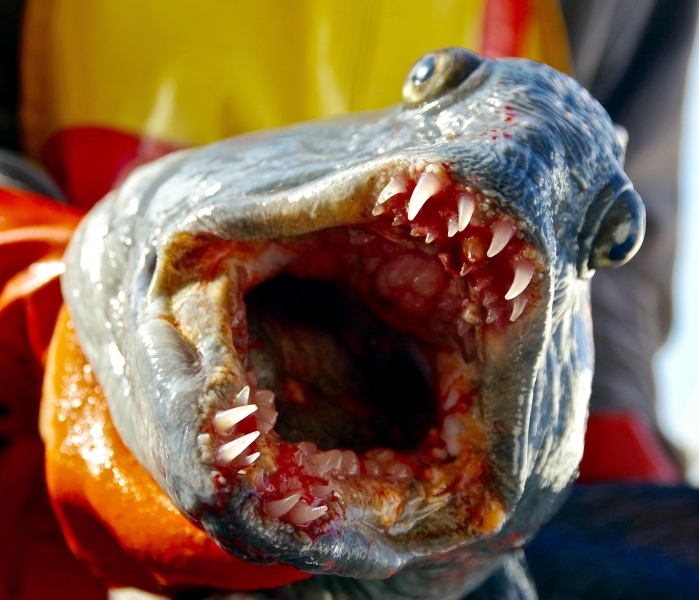 In addition, its throat is also scattered with teeth. 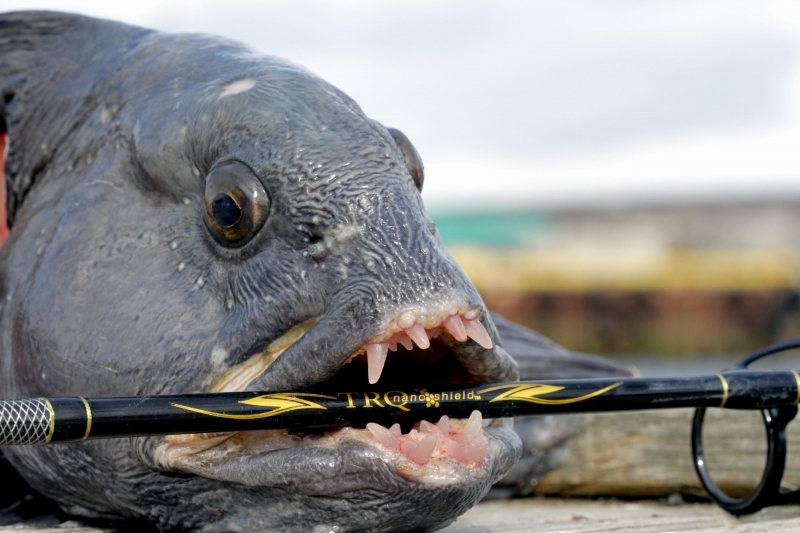 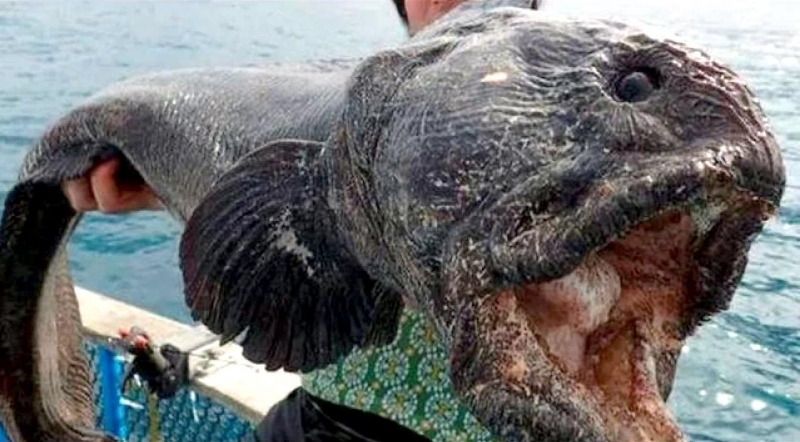 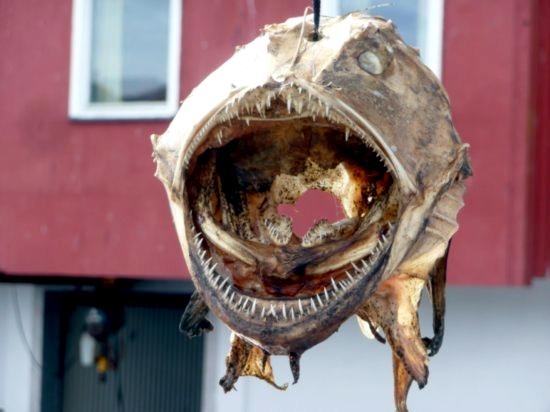 However despite this more than scary appearance, these sea creatures are not a threat to humans and only lash out when defending themselves and not as a deliberate attack, proving the age-old saying that you can’t judge a book by its cover or in this case, a fish by its fangs! 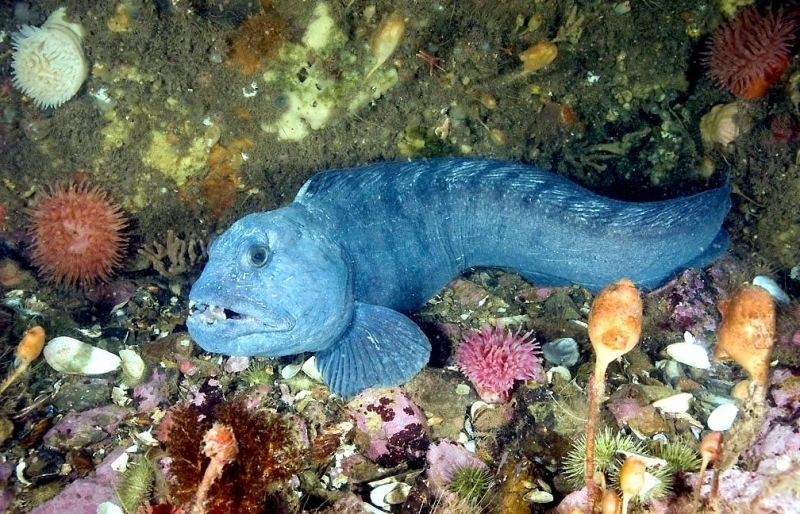 The Wolffish has 1 characteristic which makes it stand out in the undersea world. 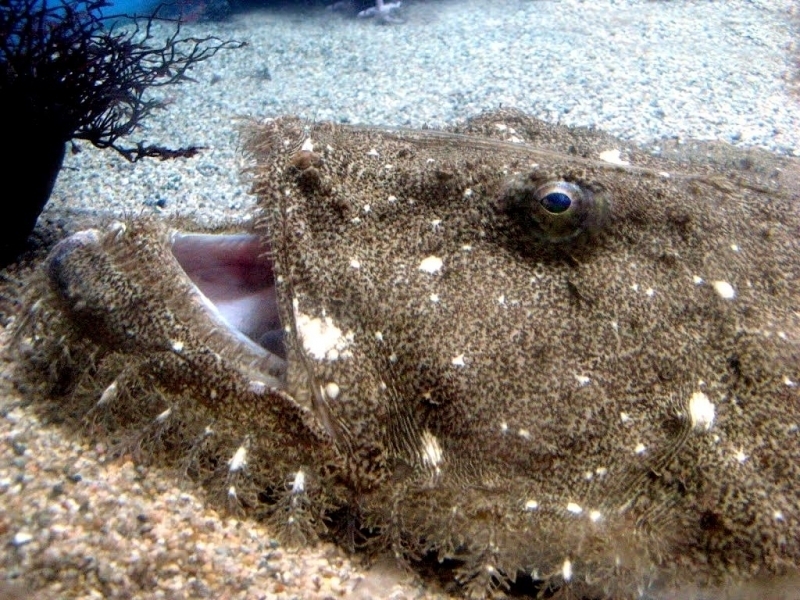 They produce a natural antifreeze which keeps their blood moving rapidly. 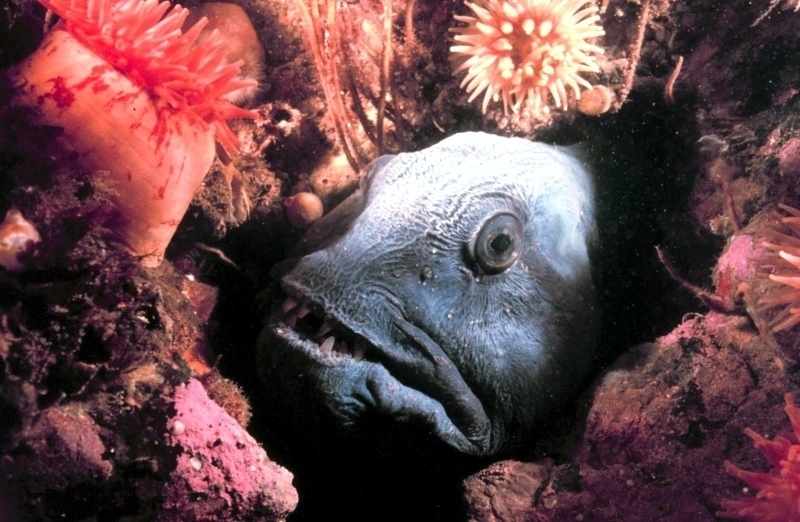 This allows them to not only survive, but live comfortably in their very cold habitat. 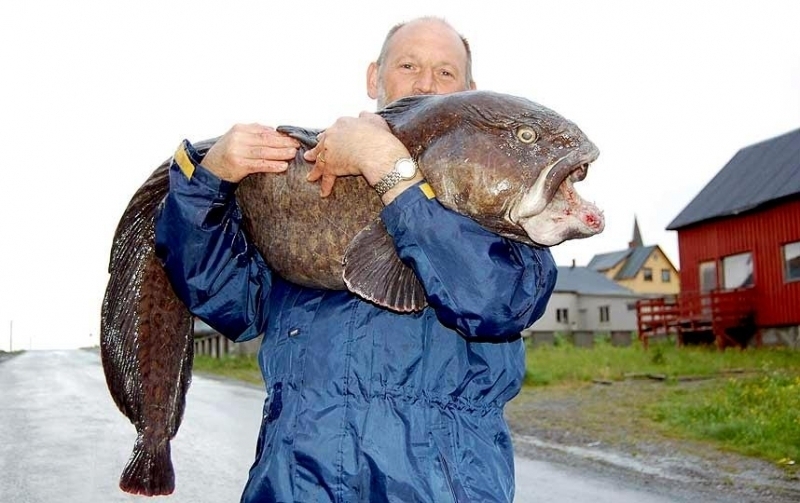 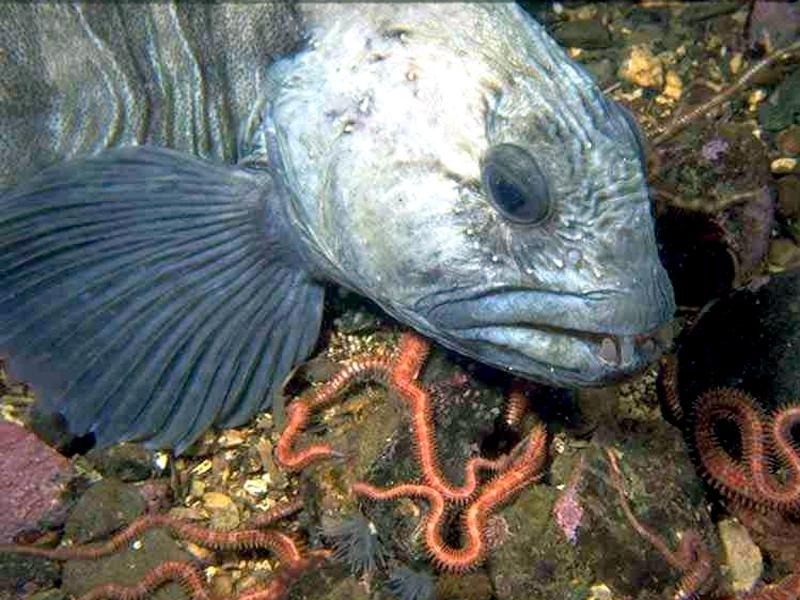 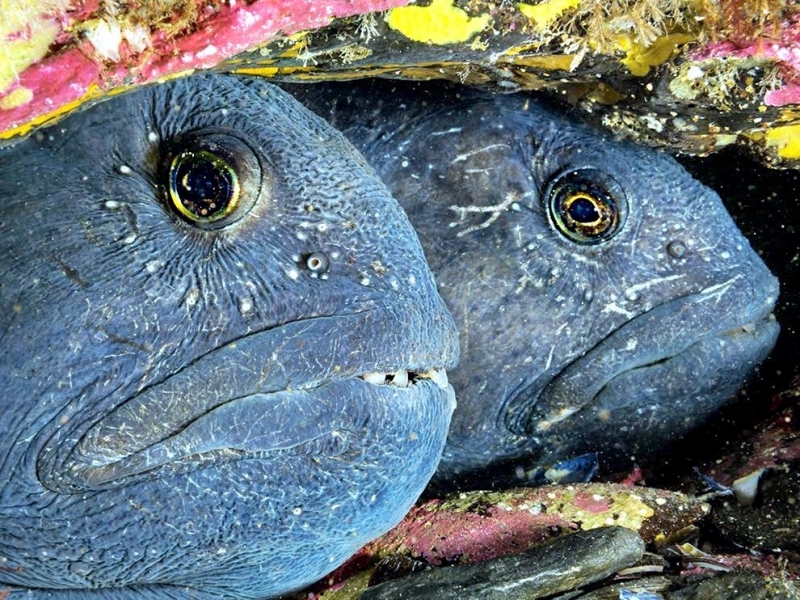 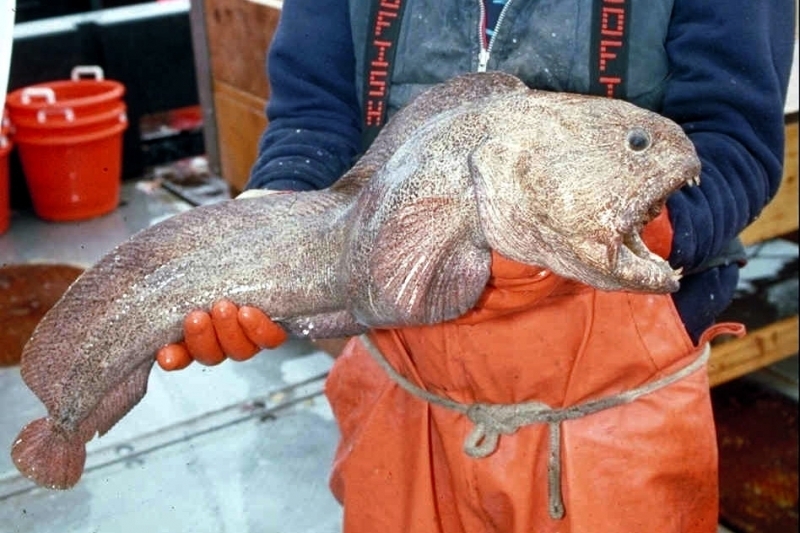 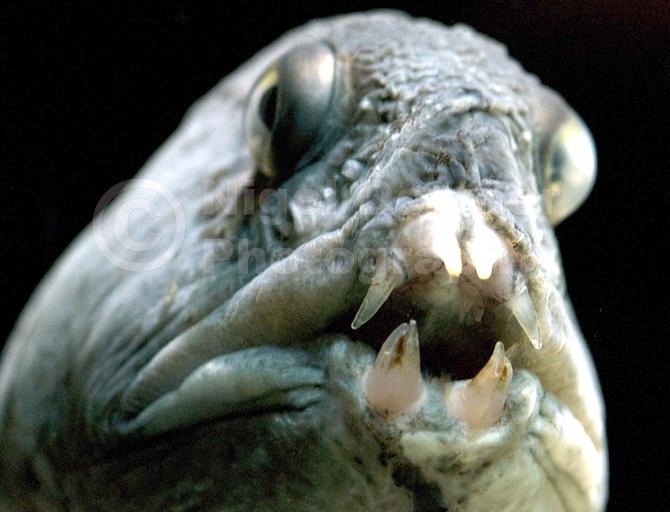 This is an ability that few creatures in the marine world possess and is one of the things which makes the Wolffish an interesting & unique marine creature. 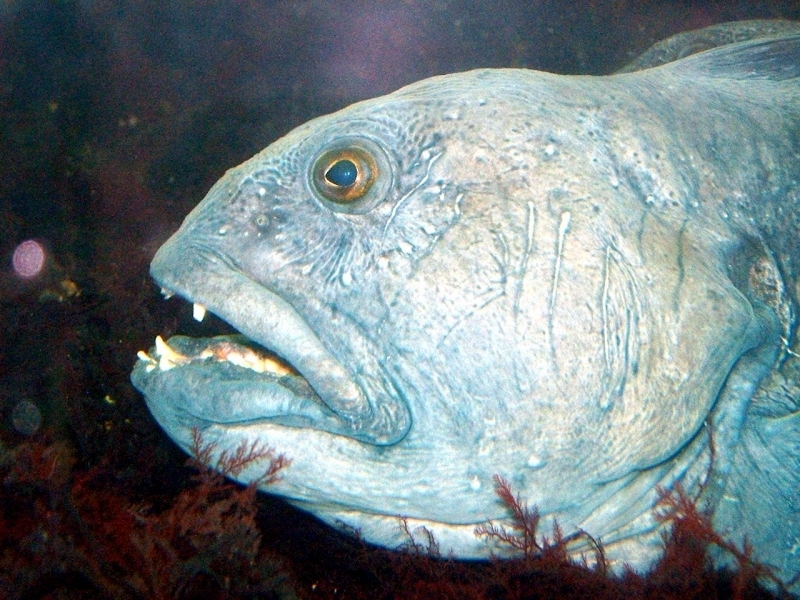 Wolffish live off a diet consisting mainly of shelled underwater life. 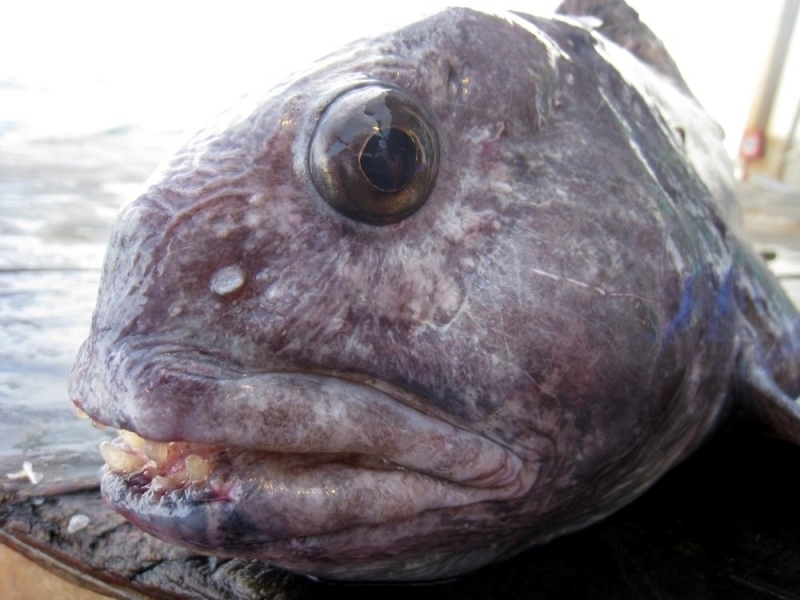 Wolffish do not eat other fish instead, their diet consists of hard-shell species such as clams, large hermit crabs, sea urchins and other crabs. 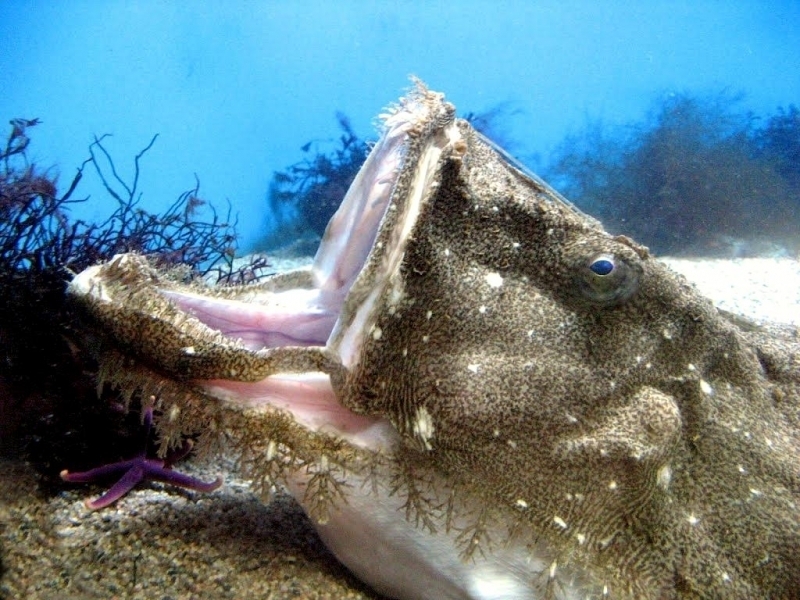 Their teeth which are extensive & lined across very strong jaws, allow them to be able to break and eat these hard creatures. 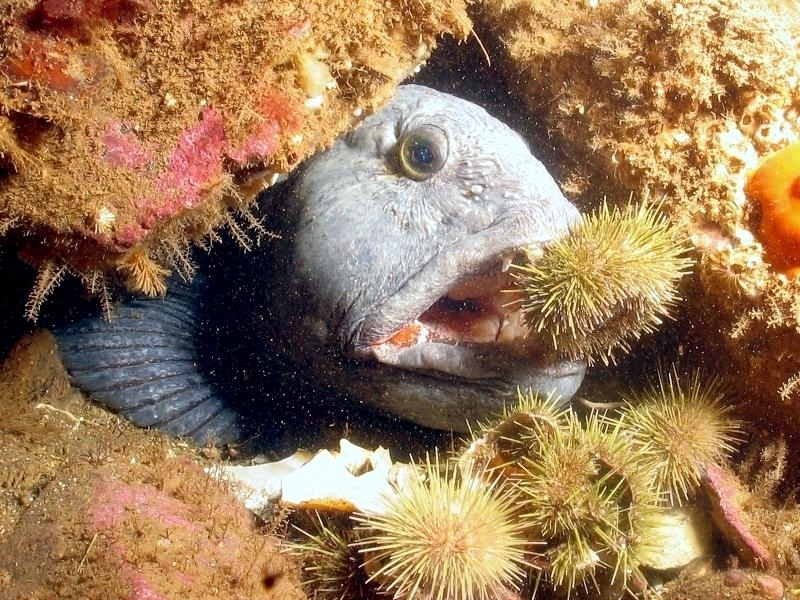 In fact, they are largely part of keeping the population of sea urchins & green crabs, both of which escalate quickly and can harm the health of marine system under control. 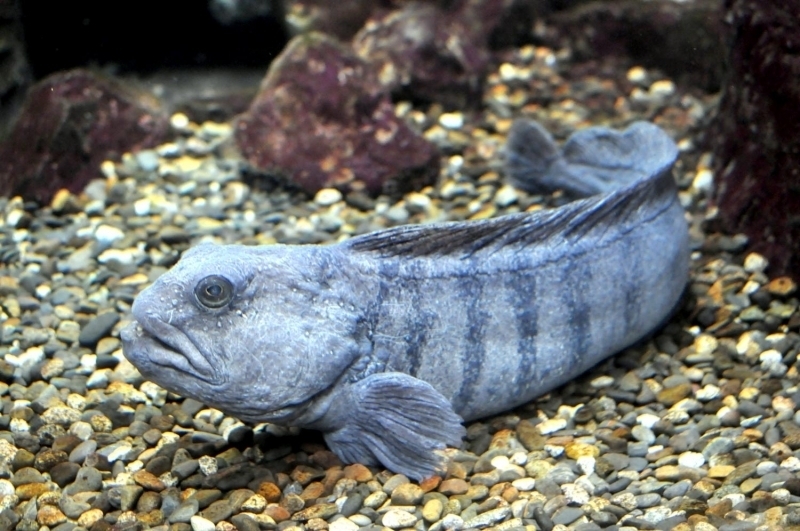 Wolffish are residents of the Atlantic Ocean, going as far north as the Davis Straight in Nunavut, Canada into the shores of Nova Scotia and even as far south as Cape Cod. 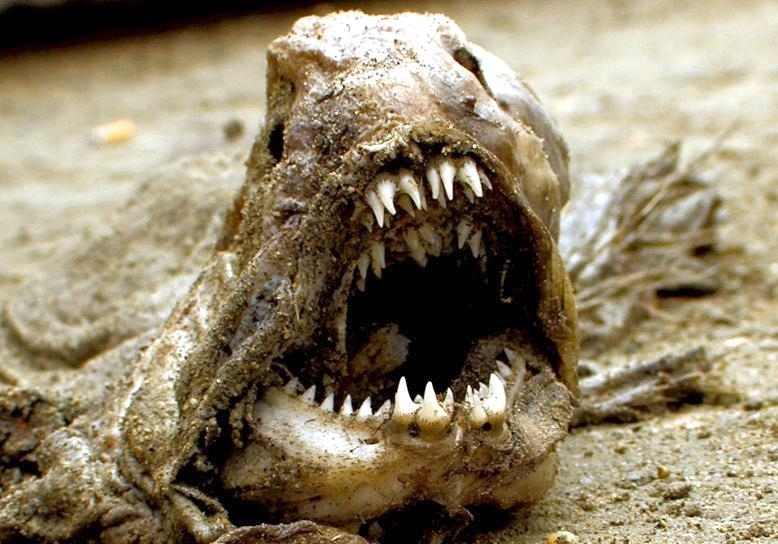 Although that is as far down as they usually live, there have been sightings of them in other places including New Jersey. 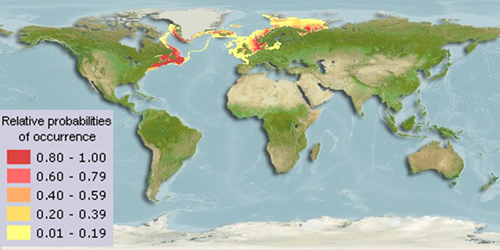 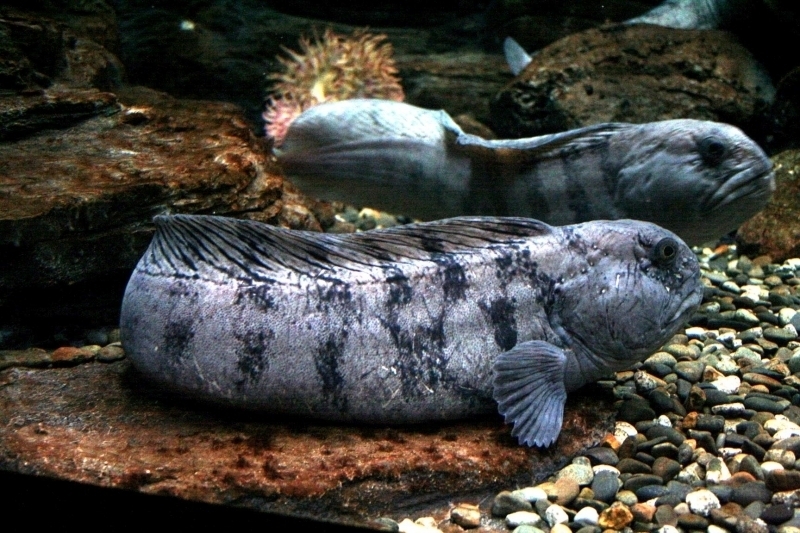 Wolffish are mainly stationary, seldom traveling very far. 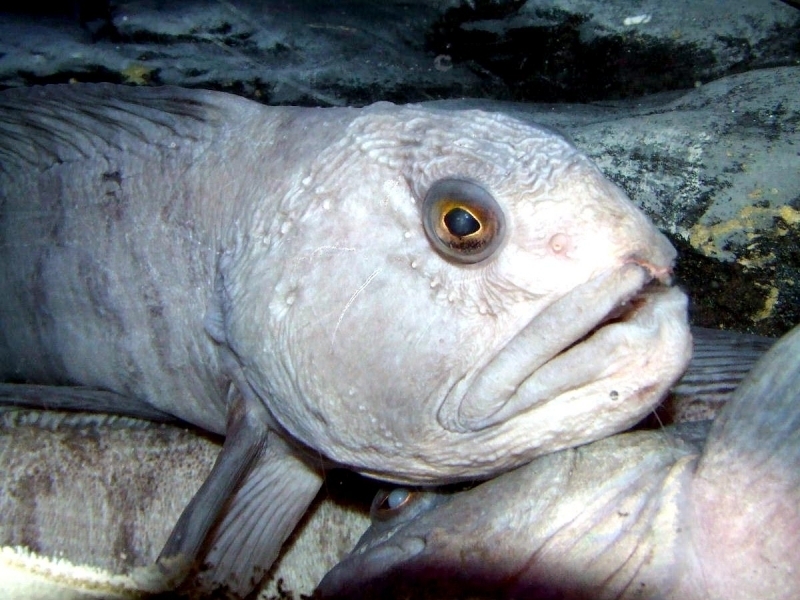 These cold water fish live on the oceans floor at water depths of 75 feet to as low as 125 feet in temperatures as low as 30 °F. 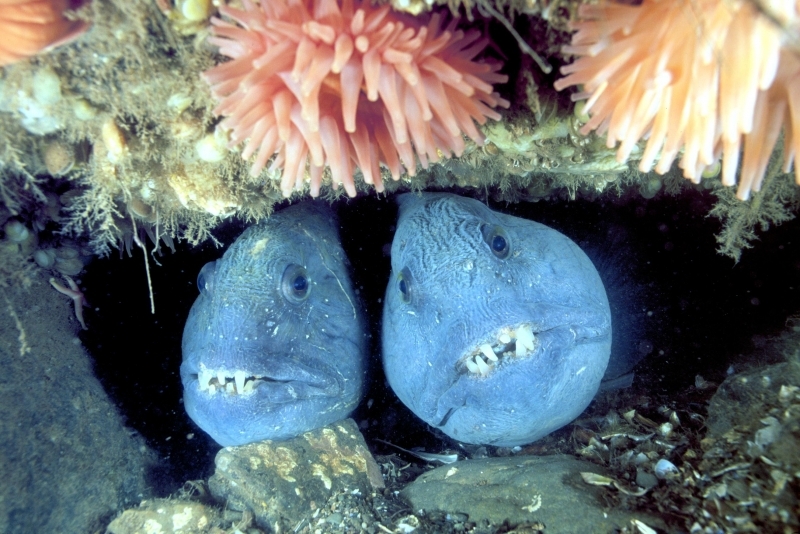 They mostly hide out in nooks & cranny’s on the floor of the ocean and in small caves. 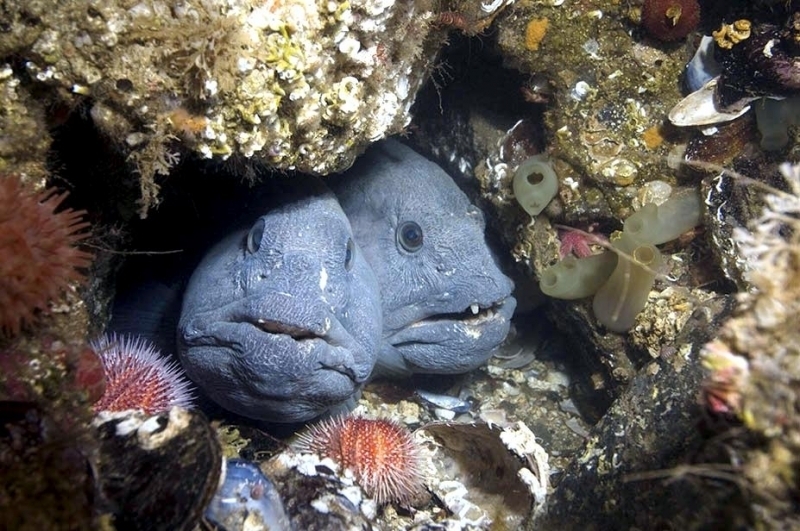 They usually stay within these small areas, seldom venturing far from them. 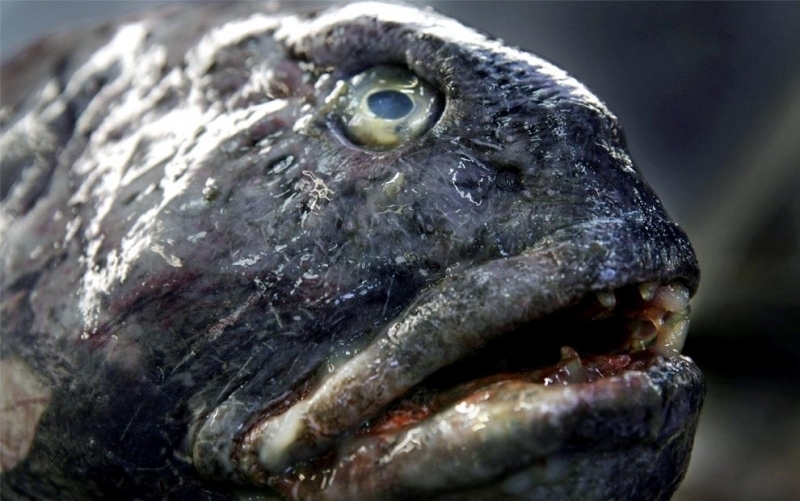 The Wolffish is a frightening species of marine life, with a natural temperament which does not match its appearance whatsoever. 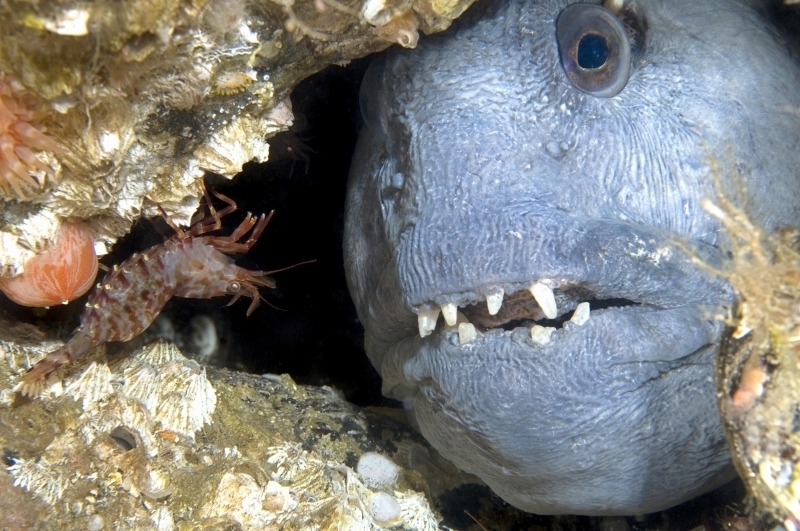 They are like all creatures of the sea, complex and interesting with a ton of intriguing facts to be learned about them.